Right from the start, let us go ahead and admit that a “Spielberg” movie is not a genre. Although, I would debate whether or not Spielberg qualifies as an auteur, but that is for another time. No, for this installment of my Summer Film Series, the original plan was to discuss favorite action/adventure films that I like to watch during the summer. However, the more I thought about it, the more I realized that a lot of my options were Spielberg movies. Regardless of what one’s opinion is of the man as a director, there is no denying that he has created amazing films, from Saving Private Ryan, Jurassic Park, and the Indiana Jones Quadrilogy (Yes, quadrilogy. Kingdom of the Crystal Skull exists. Just like problematic passages with the Bible, we just have to deal with and accept that). Two films I would also include in Spielberg’s greats are the subjects for this post: Jaws and Close Encounters of the Third Kind. Both demonstrate Spielberg’s style, yet both are very different films in terms of look, theme, and tone. However, since becoming a huge fan of both of these movies a few years ago (I must admit, I was late to the party on both); I consider them canon for my summer film screenings. Keeping that in mind, and with a lot of ground to cover for this post, let us look at Jaws first. Just when you thought it was safe to go back in the water. The first “blockbuster.” Jaws enjoys the reputation of being one of the most successful thriller/horror films ever created, and certainly ranks as one of the best films from the 1970s, which is saying something considering the quality of cinema from that decade. The B-Movie concept turned into an A-list production is not only mandatory viewing for horror movie fans, but maintains a secure spot on my list for must watch summer movies. As I said, I was late in viewing this movie for the first time (only a few years ago), so for me personally and this article, nostalgia does not play a role. This is another movie in which the characters drive the story. As I said, this is essentially a B-movie, monster film but with two important factors: 1) Top-notch production value and 2) The characters and their dialogue is written extremely well. For me, and so many people, the most enjoyable facet of this movie (other than the excellent buildup of suspense) is the interaction between our three main characters played by Roy Scheider, Robert Shaw, and Richard Dreyfuss. One interesting aspect of the film is the tension between the mayor and Brody regarding how to proceed with the shark attack. For me, this is one of the most frightening aspects of the movie: that the leaders of a town would deliberately ignore warnings of danger (i.e. 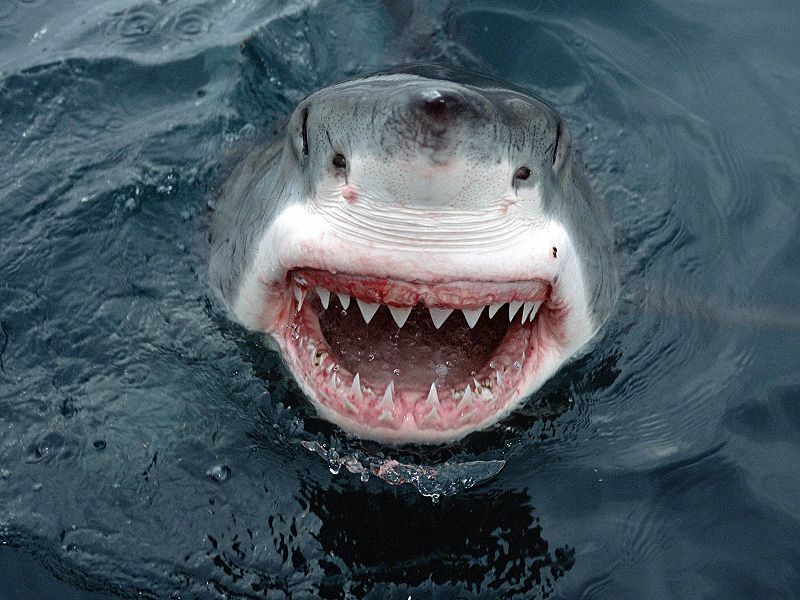 a shark attack at a beach town) if it meant potential financial and economic ruin. The sacrifice of public safety in the name of financial gain is truly horrifying. While watching Jaws again for this article and thinking about this theme, I recalled certain concerts over the past few years in which either stages have collapsed because of weather or some other catastrophic event that has caused injury and even death. At what point does public safety take a backseat to “the show must go on?” This is the same theme one finds in Jaws. Anyway, I really cannot add to much more to the film itself. Jaws is a classic, which most people have seen. The summer setting and tension is perfect for this time of year. For all the beach goers this year… keep an eye out for that dorsal fin. How I watch: I have the Blu-Ray/DVD combo released in 2012. The extra features are plentiful and the picture and sound of the Blu-Ray is top notch. I must admit, I am a sucker for Blu-Ray/DVD combos. 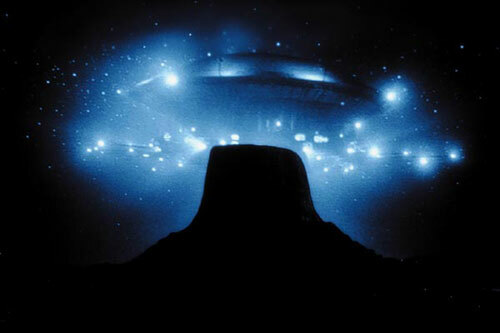 This may be my own perception, but is it just me or is Close Encounters of the Third Kind overlooked and somewhat forgotten by today’s film viewers? 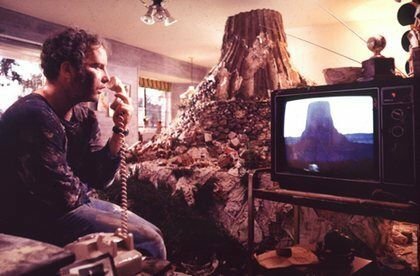 When I read or listen to discussions of Spielberg, Close Encounters of the Third Kind seems to be left out of the conversation. Is the movie passé? Was it too over-shadowed by E.T.? I think the answer is lies within the story itself. As I mentioned in my very first film post of 2001: A Space Odyssey, the American people are no longer awed by outer space and the possibilities that lie beyond. Perhaps we lack imagination, perhaps smartphones and technology has shrunk our world, thus our capacity to wonder, but outer-space does not seem to hold the grandeur in films that it once did. On a side note, this may be swinging back, as several television shows, hosted by television scientists, have reignited the population’s general interest in the subject. Returning to the film at hand, Close Encounters of the Third Kind is very different in scope as compared to Jaws. Whereas Jaws focuses on one small town, and then just three individuals, Close Encounters of the Third Kind focuses on a set of main characters, operating at different parts of the world, who’s story lines eventually intersect. The film is also larger in scale, involving cross-country travel and government involvement. The film tells the story primarily of Roy Neary (again, Richard Dreyfuss) who has a “close encounter” with a UFO while out one night. The story unfolds with his and others’ inexplicable desire to travel to Devil’s Tower in Wyoming. I will not go into too many other details, suffice it to say the film portrays Spielberg’s vision of what would happen should Earth encounter extraterrestrials. The film’s conclusion is a spectacle, both in terms of visuals and story. Why does this movie make my list for a summer film? For one, it, like Jaws, has the large production, slick design that we are accustomed to seeing during summer films. Despite the summer film qualities that I assign to it, Close Encounters was originally released in November. Another aspect of the film qualifies it for my list. It was a quality that I couldn’t really articulate, until sometime later when I saw Siskel and Ebert’s review on YouTube. Gene Siskel essentially said the movie is uplifting and leaves you with a positive outlook on humanity and the possibility of life beyond Earth. I think this is one of the best qualities of this film. The aliens are not here to take over or to annihilate humans, rather they seek (we assume) to simply make contact. The story is told exclusively from the human point of view, giving a level of mystery to the aliens. Is it no longer fashionable to have such a message in a film? Are we doomed to the bleak outlook of Nolan films for summer movies, with no room for optimism? It is worth briefly mentioning that three different versions of Close Encounters are available. The Theatrical Version, Special Edition, and Directors Cut all tell the same essential story, with some different scenes and in the case of the climax, a very different ending with the special edition. My personal preference is the Director’s cut, as it adds a great scene at the beginning of the movie and preserves the better ending of the Theatrical Version. HOW I WATCH: I own the 30th anniversary, three DVD version of this film. It comes in a glossy, very well done box with a booklet and chart that explains differences between the three versions. I believe a Blu-Ray version is available with all three versions. There is also a three-part documentary, discussing the various stages of production on the film. Highly recommended! Of course, these are not the only Spielberg films I enjoy, nor the only ones I typically watch during the summer. They are mandatory viewing for me personally, and just add to the fun of this time of year. The tension filled beach setting of Jaws perfectly complements the broad sweeping, mostly outdoor setting of Close Encounters of the Third Kind, providing excellent entertainment. Did I choose my Spielberg films wisely? Sound off below if you like these films or feel I should have chosen different movies for a Spielberg list. Stay tuned next week for my next installment in the Summer Film Series! Thanks for reading. This entry was posted in Movies and tagged Beach, Classic Movies, Close Encounters, Close Encounters of the Third Kind, Jaws, movies, outer space, Spielberg, Spielberg films, Steven Spielberg, Summer Blockbusters, Summer Movies. Bookmark the permalink.